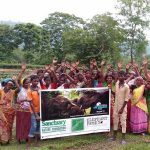 World Elephant Day 2018 is here, and, in keeping with tradition, we wanted to devote some time and attention to what’s happened for the elephants over the past year. There is, as always, good news and bad, but we are hopeful that the tide overall is beginning to turn in the elephants’ favor. Because so much is going on, what we detail below is not meant to be comprehensive. It is instead a summary update of some of the issues that the world’s elephants currently face, as well as an elaboration of other issues that have caught our attention and are a cause for continued concern. The big overarching problem, of course, remains human-elephant conflict (HEC): the classic, perennial struggle over land and resources. We report about it every year because it is a constant—the prevailing issue of the day. We’ll discuss it in more detail later in the review. The council is a pro-hunting group of politically connected donors with ties to the gun industry. The August 1 lawsuit is contesting the group’s legality. On another front, Botswana, the country with the largest number of African elephants on the continent, is contemplating lifting its elephant hunting ban. Botswana argues that it has too many elephants, with escalating human-elephant conflict as a result. One manifestation of this is the classic case of elephants raiding farmers’ crops. Apparently to Botswana’s way of thinking if the hunting ban is lifted some of these troublesome elephants will no longer be a problem. However, in this they make a fundamental miscalculation given that typically large bulls are targeted in a trophy hunt, which takes place during the dry season. Crop raiding, on the other hand, usually involves young bulls or herds of families foraging for food during the rainy season. In any event, to even contemplate a lifting of the ban, Botswana must first determine exactly how many elephants it has. The government puts the population size at 237,000, while surveys conducted by the Department of Wildlife and National Parks (DWNP) and Elephants Without Borders (EWB) estimate 130,000 individuals. There has been some talk that Botswana is deliberately inflating the numbers to justify a lifting of the ban. A new census is underway, the results of which will be published early in 2019. Initial findings, however, are exceedingly grim. They reveal an elephant poaching hot spot in Okavango Delta, a highly protected area of Botswana. This underscores that Botswana doesn’t necessarily have an elephant overpopulation problem. It would appear instead that it has a serious poaching problem. One argument that is constantly trotted out in support of elephant hunting is that the money generated will be used for conservation purposes. However, corruption being an ever-present evil, this argument has a hard time holding water. Last year a study conducted by the wildlife trade monitoring network Traffic found that sophisticated ivory trafficking in central Africa is driven largely by corruption. A glaring example is the recent allegation of ivory trafficking leveled at former first lady of Zimbabwe, Grace Mugabe. In another instance, in Mozambique, tusks stored by the government mysteriously seem to keep walking away. One of the three public servants arrested in connection with this was the Chief of Provincial Forestry and Wildlife Services in Niassa. Zimbabwe has other PR problems when it comes to elephants, namely the continuing capture and export of them to Asia. In October of 2017, estimable wildlife journalists Christina Russo and Adam Cruise wrote a groundbreaking story in The Guardian on the subject. In it they reported that earlier in August, fourteen young elephants had been captured for sale to a Chinese national with a track record of animal neglect (see video here). These elephants were ultimately destined for Chinese zoos. CITES regulates the trade in live animals, but there is ongoing concern that the trade requirements that CITES itself established are not being met—and yet the trade continues. In the years 1990 to 2015, per the CITES trade database, 1,774 wild African elephants were exported. Five hundred and eighty-three of them were destined for circuses and traveling shows, and 331 of them were destined for zoos. As if being torn from their families and incurring abuse in the process weren’t enough, typically zoo elephants are fated to an existence marked by misery and isolation, as filmed by the renowned Australian writer/wildlife conservationist Sharon Pincott when she visited the Beijing Zoo this year (see her videos here). Other zoos across Asia also tend to isolate the animals, although in Japan there are some faint hints this might be changing. Elephant lovers and animal rights activists know that elephants are extremely social creatures. They also argue that they are not “things.” Indeed, they are autonomous creatures and as such are entitled to choose how to live their lives, which includes the right of bodily liberty. That, specifically, is being argued in an ongoing legal case that aims to release elephants from a Connecticut zoo. Elephant captivity is always a bad idea, no matter where it is. India grapples with the issue, given that so many elephant there are used and abused in temple ceremonies. There are roughly 10,000 processions or ceremonies in one Indian state alone (Kerala) and it is traditional to feature elephants in many of them. This is big business, with big bucks—as much as $5,000 per day per elephant—changing hands between elephant owners and temple authorities. The litany of abuses that these captive temple elephants suffer is seemingly endless: many are deaf from the thundering festival noises and fireworks they’re forced to endure day in and day out—often for twelve hours a day without respite. Many aren’t adequately fed, housed, or otherwise cared for, resulting in lung abnormalities, intestinal problems, and severe dehydration, among other problems. Routinely they are forced to stand and walk on hot tarmac and, during their mating period when their hormones are surging (“musth”), they are not permitted to act on their natural aggression. Instead they are given hormone-suppressing drugs that damage their internal organs. Forty-six captive elephants died in 2016 and 2017 in Kerala alone. In 2018 to date in that Indian state, seventeen captive elephants have died, largely due to the abuse they suffer day in and day out. Fortunately, thanks to Asian elephant activists like Sangita Iyer and her seminal documentary film Gods in Shackles, a spotlight is being cast on the bleak temple elephant scenario. We hope that change is in the air—and more importantly on the ground, where it matters most. There is also the issue of elephants in circuses. The great news in this department continues to be that Ringling Brothers shut down in May of 2017 after having ended its elephant act the year before. In terms of the bigger picture, the use of wild animals in circuses has been prohibited in forty countries worldwide. Canada has thirty local bans in place. In the U.S., in more than eighty jurisdictions in twenty-nine states, full or partial bans are in effect. (For a full listing, click here.) Illinois was the first state to ban elephants in circuses and travelling exhibitions, and a handful of other states are contemplating this too. Legislation that would provide a blanket ban, The Traveling Exotic Animal and Public Safety Protection Act, is also being considered on the federal level in the U.S. In the U.K., the public is lobbying to ban advertising that promotes vacation destinations where elephant riding is featured or that involve live shows in which elephants are part of the act. And the state of Uttarakhand in India has just outlawed the commercial use of all elephants. It would be great if India’s twenty-eight other states follow suit! 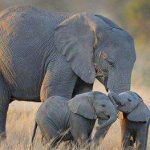 Hopefully some of these positive trends, which reflect the global public’s growing sensitivity to the elephants’ welfare, will gain momentum in the days and weeks ahead. As we know, the poaching of elephants in the wild remains an ongoing problem. Given that the death rate of African elephants still exceeds the birth rate, and because of other factors such as HEC, the overarching elephant population of Africa continues to decline. That said, as of October 2017, according to CITES, in eastern Africa the rate of poaching has dropped to 2008 (pre-crisis) levels and overall across Africa poaching is down. However, various pockets in Africa can’t report the same good news. Elephant poaching is increasing in some areas of the south, particularly Kruger National Park in South Africa and in northern Mozambique. To help address this, a stirring conservation project by the name of Moving Giants is bringing elephants from South Africa to Mozambique. South Africa’s Venetia Limpopo Nature Reserve (VLNR) has a carrying capacity of sixty elephants, but as of this July had more than 270 elephants. 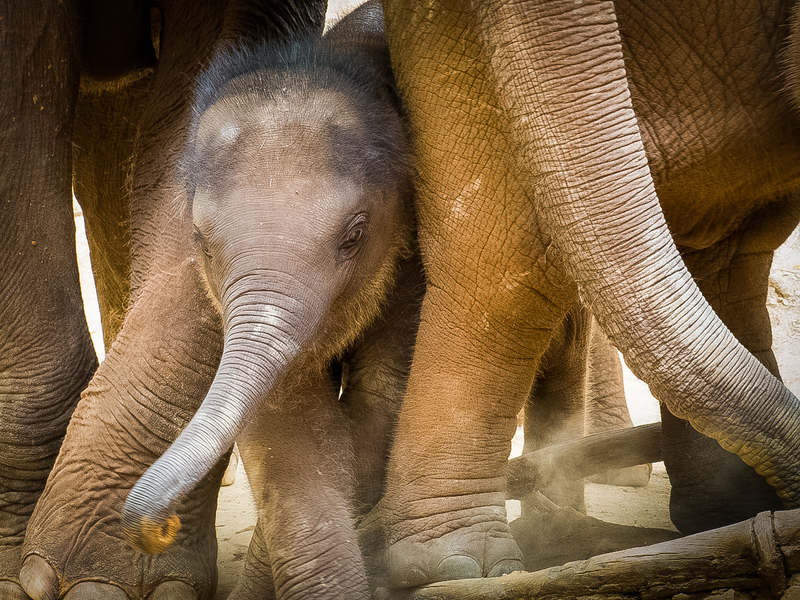 To ensure the long-term biodiversity of that fragile ecosystem, 200 elephants have to be moved to another home. AAfter extensive research, that new home was chosen: Mozambique, whose national parks lost nearly all of their wildlife after a devastating civil war (1977–1992). Moving Giants is the largest elephant “re-wilding” effort ever attempted, from South Africa to Mozambique, as 200+ elephants will journey 1,500 kilometers to their new home. In the initial phase of the process fifty-two elephants were moved, four of whom did not survive the experience. The Moving Giants initiative is a collaboration between the owner of VLNR, De Beers Group; Mozambique and South Africa’s governments; and Peace Parks Foundation (PPF), the NGO managing many national parks for Mozambique. 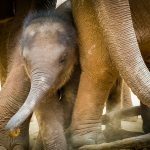 Moving Giants’ website (MovingGiants.org) will have full coverage, an autumn video series, and inspiring elephant-oriented news from around the globe. In addition to what’s going on in southern Africa, the elephants of central Africa have also been under continued duress from poaching. Here the forest elephant populations have suffered precipitous declines of more than 60% since 2002, resulting in their now inhabiting only one-quarter of their former range in the Congo basin. Minkébé National Park, for instance, in Gabon, has witnessed an 80% decline of its forest elephants in the last ten years. The situation here is so appalling that the British Army has stepped in to train eco-guards in military tactics and techniques. The forest elephants of Central Africa are also increasingly being plundered by the Lord’s Resistance Army (LRA). Under the direction of its leader Joseph Kony the LRA is using the revenues derived from the sale of contraband ivory to fund its nefarious network. Sadly, when we lose the forest elephants we lose the forests, and their capacity—as the planet’s second set of lungs after the Amazon rain forest—to generate oxygen. Fortunately, five central African countries are coming together to work collaboratively to improve legal enforcement measures in the region by sharing intelligence information about wildlife crimes. Concerns about poaching and trafficking are certainly valid but often serve to mask the underlying mother of all concerns: Demand. Until the public appetite for ivory slackens, it will continue to be one step forward, two steps back on all of these other fronts. A recent study undertaken by USAID Wildlife Asia, Beijing Normal University, and the marketing concern GlobeScan pinpointed the Chinese consumer’s appetite for and awareness about elephant ivory. One of the study’s more sobering findings was that less than half of the (Chinese) respondents were aware of China’s recent ivory ban. The study also found that 82 percent of those Chinese people surveyed who had purchased ivory in the past intend to purchase it again. In addition to elephants being poached for ivory, they continue to be poached to supply a new demand for their skin. This is particularly true in Myanmar, where the skin is ground up for use as medicine and for jewelry, with Chinese customers being the recipients of both products. In October of 2017, CITES reported that while the global trade in illegal ivory stayed the same (as it had been for the past six years), the number of large-scale ivory seizures in 2016 was at an all-time high. An example of a truly spectacular seizure is the recent Operation Thunderstorm, news of which broke in June of 2018. This massive seizure involved ninety-two countries and the confiscation of thousands of live animals as well as many other types of wildlife contraband, including elephant meat and 1.3 tons of ivory. In terms of sentences for wildlife crimes, across Africa they remain uneven. In Kenya, where elephant populations are now relatively stable, a man found in possession of thirteen pieces of ivory was recently given a jail sentence of eight years. Indeed, reflecting the gravity with which Kenya’s government views the problem, there has been some talk of establishing the death penalty for wildlife poaching in Kenya. (Currently a poacher faces life imprisonment or the payment of a fine not less than 20 million shillings, about $200,000 U.S.) Although overall Kenya is headed in the right direction in terms of deterrent sentencing for wildlife crimes (poaching and trafficking), in early August of this year a Kenyan judge reversed an earlier court decision that had put ivory trafficking kingpin Feisal Mohammed behind bars for twenty years. That reversal is being appealed but in the meantime, Mohammed is free. Singapore tells us that it is contemplating a domestic ivory ban. It banned ivory import and export in 1990, although ivory that entered Singapore prior to 1990 is legal. The trade in these Pacific Rim countries must be closed for Chinese demand to drop. If this happens and enforcement is strengthened, then perhaps China’s appetite for ivory will ultimately wither away. Last year, the U.K. was named as the world’s largest exporter of legal ivory between 2010 and 2015. This helped put pressure on that country to close up shop. A bill to close ivory loopholes in the U.K. is currently wending its way through Parliament there. Pressure is on the E.U. to do likewise, especially given that a recent study by Elephant Action League, Avaaz, and Oxford University found illegal ivory for sale in ten E.U. countries. In the U.S. nine states have outlawed the ivory trade within state borders: California, Hawaii, Nevada, New Jersey, New York, Oregon, Washington, New Hampshire, and most recently, Illinois. Massachusetts has been valiantly trying for some time to pass an ivory ban bill and although H19 passed their House of Representatives, they must restart their efforts with the advent of the new legislative session in January 2019. Vermont is also going to resume the fight to pass an ivory ban bill in 2019. As regards Canada, despite repeated pressure being put on that country’s government by way of a petition that 125,000 elephant lovers have signed, urging Canada to close its legal trade and ban imports and exports, Canada remains impervious and intractable on the issue. Meanwhile online, Facebook faces allegations of SEC violations as they pertain to that platform’s trade in illegal products, including elephant ivory. Across the African continent elephant habitat is rapidly shrinking or being otherwise infringed upon: Virunga and Salonga National Parks in DRC will be opened up for oil drilling; a large-scale logging project is being planned for the Selous Reserve in Tanzania; and human encroachment is adversely impacting forests in Ghana. This shrinking of the elephants’ range will only serve to worsen human-elephant conflict (HEC) in these areas. It’s worth noting that the farts and burps of livestock are a major source of methane, an extremely potent greenhouse gas. “Scientists calculate that over a 100-year period the ‘global-warming potential’ of the gas [methane] is 28 times greater than for carbon dioxide.” Thus does the increasing cultivation of livestock for food contribute directly to climate change. This serves to perpetuate the downward spiral of deleterious effects—such as drought, flooding, and wildfires—upon wildlife and the planet. Because of the dire trajectory that these findings imply, we continue to believe that solutions to HEC must start with an honest acknowledgement of the need to limit the growth of the human family on the planet, (currently 7.5 billion people). Without this, all other attempts to mitigate HEC fall short. India currently has 1.3 billion people, and if the current fertility rate prevails (2.4 births per woman), that country’s population is expected to be in the neighborhood of 1.8 billion by 2050 and 2.5 billion by 2100. Last year, India told its parliament that in the past eight years, elephant deaths due to HEC were in the neighborhood of 700. It also stated that in terms of human HEC casualties, 1100 persons were killed in the previous three years. That’s India. As regards Africa, its population is currently 1.2 billion people, expected to climb to 2.4 billion by 2050. And we think human-elephant conflict is an issue today? . . .
That’s why it’s important to have a whole-systems approach when considering HEC solutions. This begins with an appreciation of the fact that elephants are migratory creatures and their traditional migration paths and corridors must be maintained, without human encroachment, and respected. In short, elephants must be prioritized and in this, be allowed to retain their right of way. For further reading on India’s elephant corridors, please see the definitive study entitled “Right of Passage,” published in 2017 by the Wildlife Trust of India. According to a recent article in India’s Deccan Herald, as of last year only 1.8% of India’s 101 elephant corridors had no human settlements in them. 1.8%! Surely India can do better. The same article goes on to say that 20% of India’s corridors are crisscrossed by rail tracks. As many people know, elephant mortality as a result of railway accidents is very high in India. Indeed, from July 1987 to mid-2017, trains there killed 266 pachyderms. HEC remedies that are being tried include speed restrictions on the tracks as well as the construction of ramps across them so that elephants may have protected pathways over which to cross and otherwise maneuver out of the way of approaching trains. Oftentimes animals are drawn to litter and food discarded by railway passengers. One recent initiative in Karnataka involved cleaning up this trash, thereby mitigating elephant train deaths. In some parts of India, the sound of bees buzzing acts as a deterrent to the elephants, who fear getting stung. In other areas, sensors alert the forest department as to when an elephant is about to cross the tracks, thereby allowing them to chase the creature away before an accident occurs. In addition to being killed by trains, elephants are being electrocuted by high-tension wires at an alarming rate. A possible antidote to this is to insulate the wires with cable, which is presently being tried in India. In Cambodia, that country’s increased appetite for bushmeat is resulting in baby elephants being caught in snares, with many of them dying as a result. This year scientists continued to explore what makes elephants and other critters tick. The following are some of those findings. The nose knows: The elephants’ sense of smell is extremely developed. They top the list in terms of the number of smell receptors they have—more than any other mammal on the planet! Elephant activity changes to avoid poachers. Elephants exhibit an array of complex emotions, just as humans do. In December 2017, Prince Harry was appointed the new president of African Parks, which manages thirteen of Africa’s parks in conjunction with local communities of behalf of the government. John Scanlon is stepping down as Secretary-General of the CITES Secretariat after eight years of dedicated service. This year we lost some outstanding individuals who spent their lives protecting the elephants of the world. We acknowledge them here. South African Wayne Lotter, renowned conservationist, was shot and killed in August of 2017 in Tanzania. The director and co-founder of the PAMS Foundation, established in 2009, was 51. The PAMS Foundation is an NGO that supports local communities in Africa in the fight against poaching and trafficking. It was Wayne Lotter’s belief that PAMS had effectively decreased poaching in Tanzania by 50 percent or more. Wayne is the posthumous recipient of the prestigious International Ranger Federation’s Lifetime Achievement Award, bestowed in acknowledgment for his years spent working to prevent elephant poaching and trafficking in Tanzania and Africa. Esmond Bradley Martin, a prominent American investigator of the illegal trade in ivory and rhino horn, was killed in his Nairobi home, Kenya, on February 4, 2018. Police surmise that the murder may have been part of a botched robbery attempt or a deliberate murder attributable to his work to end ivory and rhino horn trafficking—or that his death was precipitated by a contentious local land-grab dispute. A UN special envoy on rhino conservation, Esmond Martin was highly regarded in the conservation community. His views and analysis were frequently solicited by wildlife conservation organizations as well as the House of Commons. He was 75. We continue our never-ending salute to the innumerable rangers who serve to protect the world’s wildlife every night and day. According to the World Ranger Day In Memoriam list, 128 confirmed ranger deaths occurred in the last twelve months. Words cannot adequately convey our appreciation to these relatively unsung heroes of the conservation world who tirelessly and humbly work to preserve that which we all love the most. Last, but by no means least, the Grande Dame of elephant conservation, Daphne Marjorie Sheldrick, passed away on April 12, 2018, of breast cancer at the age of 83. Born in the British colony of Kenya in June of 1934, Daphne wed renowned naturalist and founder warden of Tsavo East (Kenya’s largest national park) in 1960. Soon thereafter Daphne perfected a milk formula that successfully replicated a mother elephant’s milk, without which a baby elephant will not survive. The wildlife conservation work she performed with her husband included rehabilitating orphaned animals for release back into the wild. She established the now legendary David Sheldrick Wildlife Trust in her husband’s memory after his death in 1977. She is the recipient of an M.B.E. bestowed by the Queen of England in 1989 for her work protecting Africa’s wildlife. In addition, in the 2006 New Year’s Honors List, Queen Elizabeth II appointed Dr. Daphne Sheldrick to Dame Commander of the Most Excellent Order of the British Empire. Dr. Dame Daphne Sheldrick is the recipient of numerous other prestigious accolades and awards. We conclude our Annual Review this year with Daphne’s insightful words about why we love elephants so much. “Their tremendous capacity for caring is, I think, perhaps the most amazing thing about them.